Apple has always advertised the iPad as achieving all day battery life. I've generally found that to be true based on my usage, although on days where I use the larger iPad Pro with the Apple Pencil heavily I can find myself looking for a charger by the time the work day is over. With our 2016 mobile test suite we've rolled out a new WiFi web browsing test that is more taxing on devices than the previous one, along with moving from GFXBench's T-Rex HD battery test to Manhattan Metal. With the 9.7" iPad Pro having a similar battery capacity to the iPad Air 2 it can hopefully be expected that battery life remains the same, or possibly improves. In our 2016 WiFi web browsing test the 9.7" iPad Pro comes in at roughly the same runtime as the iPad Air 2. Apple has always advertised a ten hour battery life for iPads, and that generally held true in our old test which did static page loads. But in our new test the iPads simply can't last that long due to the heavier and more representative workload. 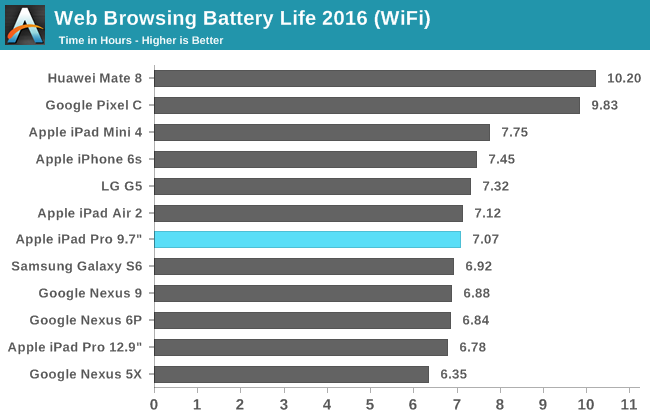 Unfortunately I no longer have the Tab S2 for comparisons to a non-Google Android tablet in this test, but when it comes to battery life the 9.7" iPad Pro lasts a bit longer than the Nexus 9 and significantly shorter than Google's Pixel C. The Pixel C is also significantly thicker and heavier, but its LTPS display also helps it to drive down platform power, and I wouldn't expect to see the iPads approach it any time soon with Apple's continued focus on driving down mass and thickness, and reliance on IGZO displays to achieve their switching refresh rate. The 9.7" iPad Pro does well in our video playback test. This test hasn't changed from the 2014 one, as my measurements found that the impact of moving to higher resolution and higher bitrate test files has a negligible impact on battery life due to the fact that the decoding for H.264 is all handled by dedicated hardware. 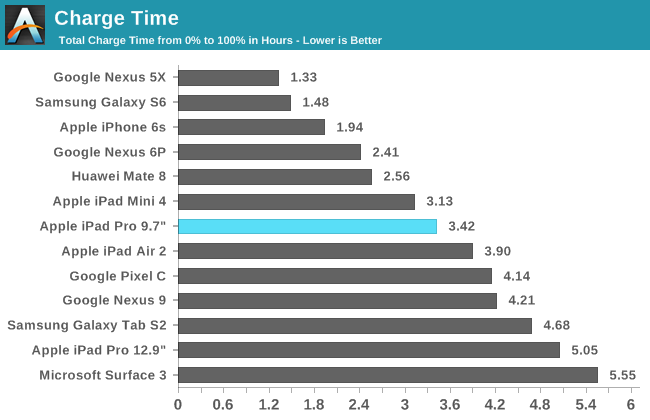 You can see that the Pixel C still leads the pack, and the Tab S2 is close behind it even though it's incredibly thin and has a relatively small battery, and this is due to its AMOLED display using much less power in low APL videos than your typical IPS LCD on a tablet. 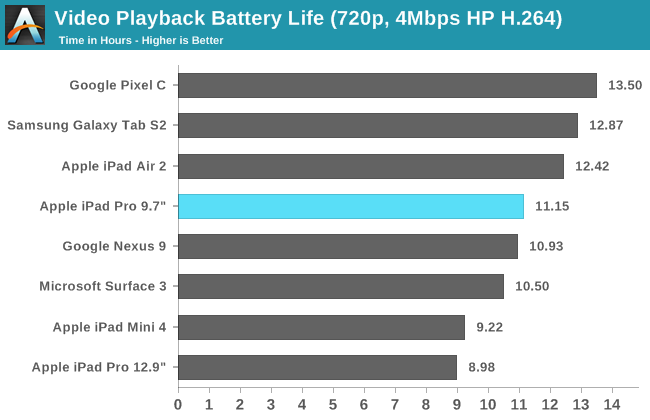 It's worth noting that we see a regression here from the iPad Air 2. The 9.7" iPad Pro actually has a slightly larger battery than the iPad Air 2, and I'm not sure where the difference here is coming from (possibly the display? ), as our video playback test is conducted in airplane mode with no background tasks or location services, so there's not much room for software variance. 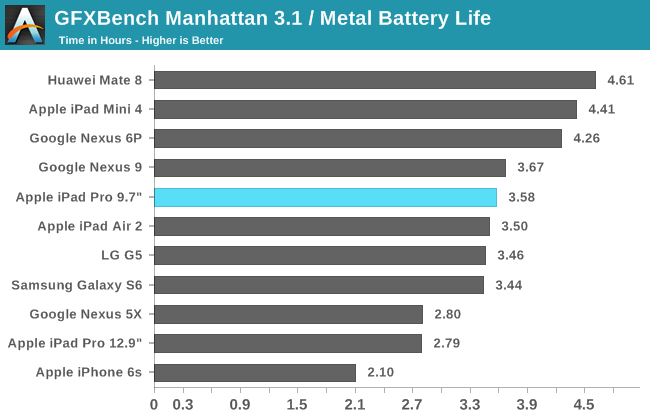 In the GFXBench 3.1 Manhattan battery test the 9.7" iPad Pro performs incredibly well. Not only does it last slightly longer than the iPad Air 2, but the GPU performance throughout the test is more than double that of the A8X. With our old T-Rex HD test we saw Apple's devices essentially maintain the same frame rate for the entire test, as the GPUs were so fast that they were actually spending time idling. 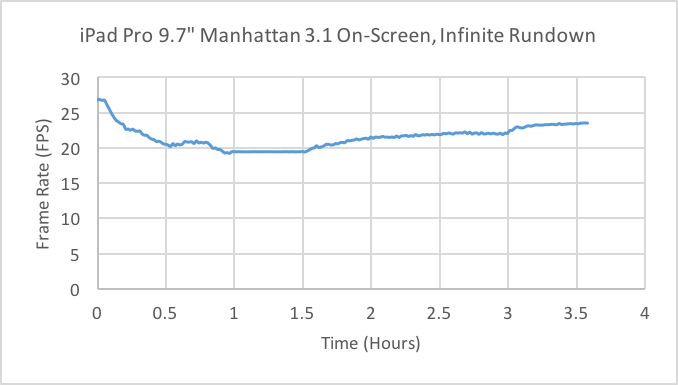 With Manhattan this isn't the case, and we see that the 9.7" iPad Pro does show signs of throttling. In general the performance is still very stable, and the throttling is not near as serious as what I've seen on competing Android tablets running the old T-Rex test with its lighter workload. Smartphones have gone from taking several hours to charge a few years ago to only taking an hour or two today. Unfortunately we haven't see such improvements with tablets. While charge times have certainly gone down with Apple's 9.7" iPads, that's due to shrinking batteries rather than significantly faster charging. With the 12.9" iPad Pro Josh measured a charge time of over five hours, which is really unacceptable to say the least. With the 9.7" iPad Pro using a battery of similar size to the iPad Air 2, it can hopefully be expected that the charge time will be similar too. Apple includes a 10W brick with the 9.7" iPad Pro. I actually haven't kept track of when they switch between 10W and 12W, but I can tell you that they need to start shipping these tablets with something closer to 20W or 30W. They happen to already sell something that fits the bill quite nicely, and customers would appreciate it. In the case of the 9.7" iPad Pro the charge time is much shorter than the five hours that the 12.9" model takes, but I think we really need to see improvements in how long it takes to charge these devices. When you use an iPad all the time for writing with Apple Pencil it will most certainly be nearly dead when you get home, and that means you can't use it for the rest of the night unless you keep tethered to a power outlet. Hopefully we see improvements made here with the next generation of iPads, along with the rest of the tablet market in general. I sold my iPad mini 4, just to get one of these, as I'd previously owned the Air 2 and I simply couldn't justify the extra cost. Sure, of course, it is a nice device, but all I did was launch SimCity Builit (Which didn't seem to load faster) and mess around. For all serious tasks I have the Surface Pro 3. It's a lot... for not a lot really. Plus, seeing as the Surface line was initially blasted for not including a stylus/keyboard, it's annoying that Apple sell them for MORE (I think) than the MS versions. 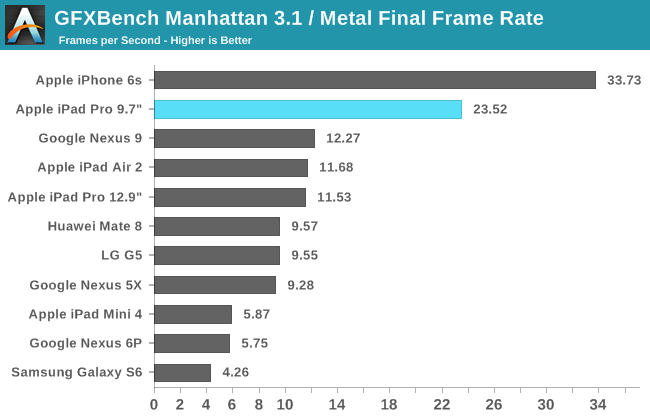 The charts do not include the Surface pro 4 for screen quality. Selective information? Gimme a break chester, this is apple's latest and greatest tablet and should be compared head to head with microsoft's latest, on all fronts. That's what apple was shooting for with this product. It is being marketed as a "Pro" line product... thus it should be compared to other Pro tablets. The complaint is that there is inherent apple bias in the that article has extended to the benchmarks. The surface pro 4 may very well be inferior. But this "review" is deceptive. Why not just follow Apple marketing guidelines and compare the ipad pro to "5 year old pc's everyone is leaving for iPad". I can understand not being happy with facets of the review. Chalking up your concerns to "you're a horrible person" isn't the most constructive line of dialogue. It looks like your response was nicely responded to. I'd encourage more discussion instead of tin foil hat guttural response. I think we get it from your responses that your using global stereotypes to paint a picture that everything is inferior to what you have. All of that said, I haven't been a fan of the Microsoft Surface line till this generation. There's a certain rhythm of finally "getting it" in terms of fit and finish that I don't think Microsoft has had in hardware till this year. The Surface Pro and SurfaceBook are both impressive devices. If what I wanted as an individual could be served by the Windows ecosystem (phone through tablet) I would be giving it a much more serious look. Apples attitude towards user experience and hardware has been, and still is to a certain degree incredibly different then Microsoft and most other OEMs. You can call it "bad" as much as you want, and that's your right to do so. I have a few iPads in my house, and got one for my little brother to use in college. They are arguably the best overall tablet on the market from hardware onto ecosystem.